These silver logo tags are sewn into the collars on t-shirts, button-front shirts, sweaters, and sweatshirts. The ends should be folded under, not frayed or cut. The thickness and size of the lettering is the key to distinguishing the real from the fakes. It takes a close look but if you compare the examples above you will note the differences. The fake "D" is thicker and the tag itself is a little shorter. I included the fake examples above because the first picture has black stitching and the second pictures has "homme" on the tag. The silver dior logo tags are always stitched with silver thread (never black). Also, the word "homme" is never spelled out on the silver logo tag (only on the fabric composition tag sewn inside the shirt seam. The embroidered bee is one of Hedi Slimane's little trademarks. The bees are embroidered on many styles of shirts, sweatshirts, t-shirts, and sweaters (and a couple styles of slacks). There has never been any embroidered bees on jackets, suits, coats, or jeans. The bee embroidery is always about 2/3 of the way down the front of the shirt on the left side. This applies to t-shirts, polos, sweaters, and sweatshirts. 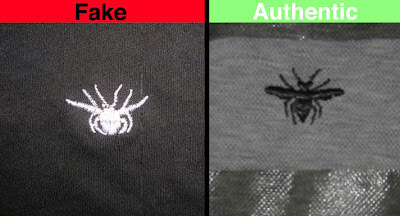 Oftentimes fakes have the embroidery very close to the hem of the shirt (as seen in the example above) or elsewhere, such as on the back of the shirt. I doubt the one above would be able to fly with its fat little body and skinny little wings. This one is better proportioned, but seems to have a splitting headache. ...oddly enough these shirts have sold several times on eBay. There are actually people willing to buy it. Crazy. There are other fake (yet totally original!) Dior Homme designs out there too. I will post more pictures as I come across them. I think the key to avoiding them is to just not buy anything that looks like it was made by a 12 year old. The fakes usually give themselves away in the detailing. Buttons, zippers, stitching, etc. are all good things to be familiar with. If you are unsure about an item's authenticity on an online auction site, like eBay or yahoo auctions, ask the seller for detailed pictures so that you can examine the stitching and so on. 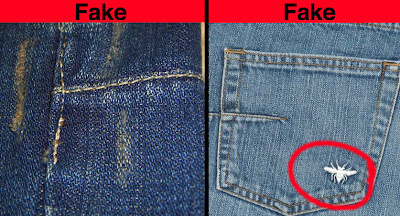 Above, in the first example you can see the poor stitching quality, common in counterfeit denim. I threw the second picture in there because there have been a few of these jeans sold on eBay with the embroidered bee logo on the pocket. Dior Homme has never produced jeans with the embroidered bee logo (only some dress pants, and shirts, sweaters, etc.). If you know a little about the brand and have never seen a particular style before, do a little research. 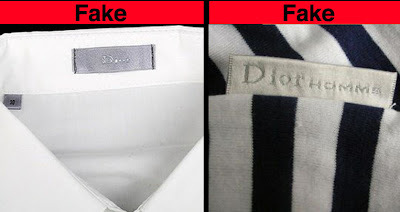 You can also check the bogus counterfeit section for examples of fake Dior Homme in styles that Dior Homme has never made (some are pretty funny). Ask the seller what collection it is from and check it out. Style.com has a good selection of runway shows of the past several years. Also you can post a question in The Fake Hunter Discussion Forum and I or another member will get back to you. It may start a helpful discussion. Case in point. Above is an example of a bogus design. Dior Homme never made jeans with stripes on the back. All Dior Homme jeans have the signature darts (aka 'scars') on the back. The counterfeiters just go crazy with those logos don't they? Yes, they even put them on the rivets too. 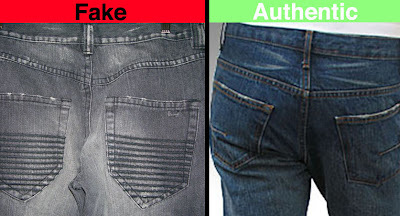 Although many designer jeans have logos on the rivets and buttons (ie. Dsquared, Galliano, etc. ), Dior Homme does not. When Hedi Slimane took over he redirected Dior as a brand focused solely on the tailoring, not logos. Instead, Slimane used signature design featuers such as the embroidered bee, the darts, the claw mark on some jeans, and so on. These days luxury denim is all about the cool, innovative techniques designers come up with to distress and treat their denim. Hedi Slimane has definitely given his contribution, from the famous waxed and ripped jeans, to his subtle, and not so subtle distressing effects. This is most always done by hand by skilled denim craftsmen. So, as you can imagine, when the counterfeiters start messing with distressing, it can get ugly. The fake distressing is often done very cheaply in straight lines with no character. The authentic pair has a rather amazing effect that took more than a piece of sand paper and a plank of wood to create. More of the same here in the example above. The distressing should be less like straight chalk lines and more like the natural creasing that occurs over time. I think that the fake pair above is almost laughable. They look horrible. Very poorly done. The authentic jeans are actually pressed into wrinkles and distressed, so it is a textured almost folded effect. The same with the back of the knees. 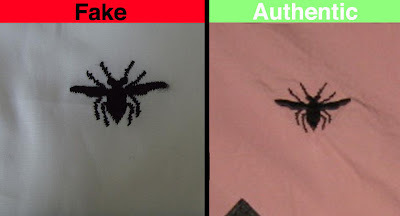 The wrinkles in the authentic jeans are real, where as the knock-off's are poorly trying to recreate it in 2-D. Also as a side note, no authentic pair of Dior Homme jeans has ever had a bee embroidered on the back pocket (like the example of the fake above). Some slacks/ pants did (and of course several shirts and sweaters) but never the denim. The silver fabric content/ care tag is sewn into the inside side seam of Dior Homme jeans. These tags do vary based on the type of jean, the collection it is from, etc. 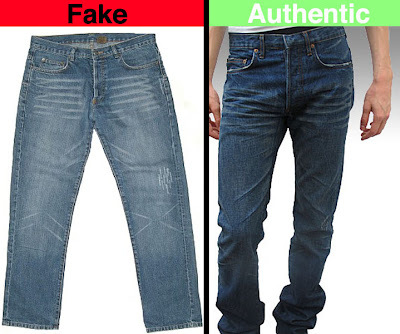 However, there are some significant differences between the fake labels and the authentic ones. 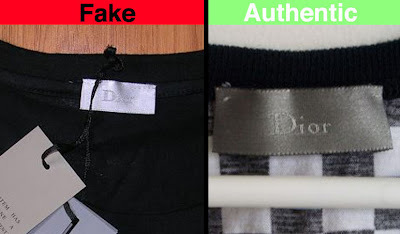 Above are three examples of authentic fabric content tags from Dior Homme jeans. You will note that there can be differences in the text and type face. The care instructions vary based on the type of jean. The first pic is from a pair of the velvet jeans, the second is the oil coated raw denim, and the third is the Strip waxed denim. Dior Homme makes jeans in Italy and Japan. 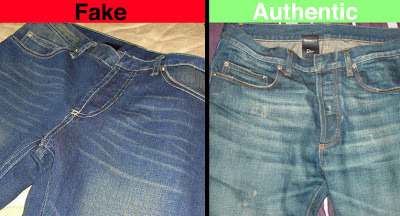 In the above comparison picture there are two tags; the left is a fake and the right is authentic. This is an example of a pretty good fake. With the exception of the missing "made in Italy," it is hard to tell the difference. Lesson here: Just because it looks real doesn't mean it is. Check the other tags and labels before deciding. It just so happens that this convincing label comes from a horribly distressed pair of fake jeans with "dior homme" engraved buttons (the authentic jeans never have the engraved buttons - only a couple of jean jackets ever did ). This is the other side of the tag which has the fabric content and the washing symbols. 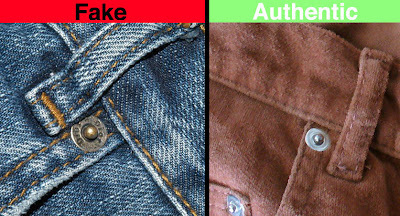 If you start to look at enough of these tags you will notice which style symbol appears on the authentic tags and which appears on the fakes. For example, the fakes often have an elongated wash tub who's sides are more vertical that the real symbols. The other dead giveaway in this is the extremely long size tag. The size tag in jeans is never this long and usually in the waistband, not by the fabric content label. The leather logo tag is sewn into the inside of the waistband at the back (The F/W 07 collection now uses a different tag though). This leather tag should have squared corners and the stitching should be even with the sides. Furthermore all the letters in the logo should be even. The above fake example shows the "D" is slightly higher than the rest of the logo. All of the letters should be perfectly aligned. The above examples of fakes I have provided are of pretty decent copies, though you can see the sloppy printing of the silver logo (especially in the second fake example). The authentic printed logos can wear off with washing and wear, but they are not printed sloppily. 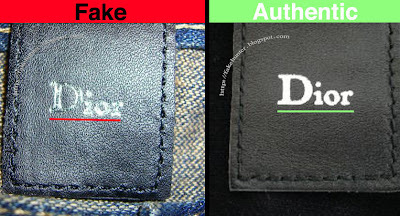 Furthermore, some fake Dior Homme jeans have leather tags with very rounded corners (see the example below). The corners should always be squared (or slightly bent if worn). This is a decent looking fake but the stitching is crooked. The black stitching around the edges of the black leather tag is always aligned with the edges. Furthermore, the stitching at the top of the tag is usually the color of the stitching in the jeans. When you are buying online it is important that you examine the details. It's always best to know what you are buying. However, many people do not have direct access to luxury stores so the research must be done online. That, hopefully, is where this site will come in handy. The counterfeiters can get pretty accurate but they will never be perfect, and these imperfections can blow their cover. 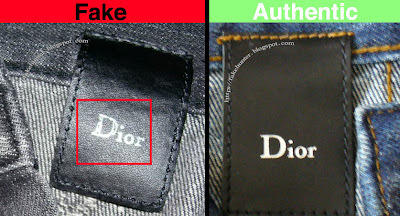 Below is a comparison photo of a detail of a fake Dior Homme jacket and a detail of an authentic Dior Homme jacket. It is kind of like those 'spot the difference' puzzles you'd play as a kid. The example on the left is authentic and the one on the right is fake. On the fake you can note the wider and strip of a different material along the zipper, wider spacing between the gold detailing, different color zipper, different style zipper, etc. BUT, you don't have to know every design by heart. First of all, if you have a question you can post it in The Fake Hunter Discussion Forum and I and/or other members (hunters) will answer it to the best of our knowledge. Furthermore, you can pay close attention to the stitching and material. Even from the photos above it is clear that the fabric on the right is of a much cheaper quality than the fabric on the left. Also pay close attention to the seams, especially in places like a zipper or a button hole. Don't sweat it though. You don't need to get caught up in too many details. The other basic hunting tips will often let you know it is a fake before you need to do much research. However, if you are getting ready to drop some serious cash, check all the details you can. If the seller's pictures are small or blurry ask for better quality pics! Don't base your authentication process solely on whether or not the item in question looks like a detail picture on this site. Rather, you should use the detail pictures to learn how the authentic item is made and how SOME of the fakes look. If you read the articles related to the item in question you should be able to gather an informed opinion. If you have further questions you can post them in The Fake Hunter Discussion Forum, which may start an informative discussion and help others with the same questions. 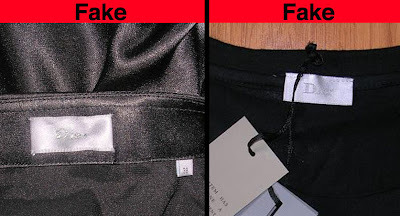 One of the best ways to distinguish a fake item online is by the labels and tags. 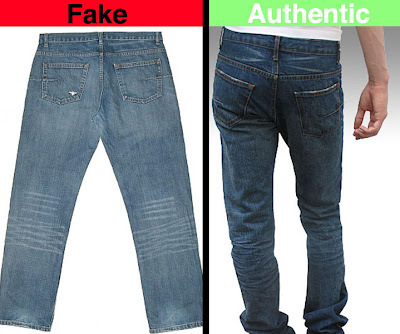 The tricky thing about spotting fakes online is that you cannot touch and examine the item. Most people would be able to tell which is fake by simply feeling the difference in the quality of the fabric and seeing the quality of the stitching and details. Since we do not have that luxury online the key is in spotting the details in the photos. 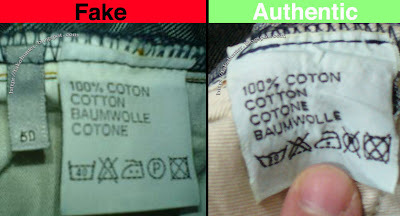 Fake tags and labels vary in degrees of replication. 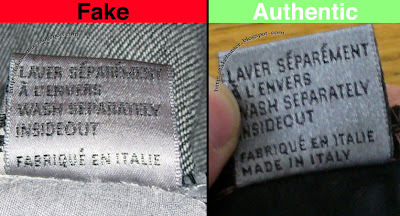 Some fakes have downright bogus tags whereas others have pretty well copied tags. If you cannot see the tags clearly in the photos you should ask the seller for better pictures with some closeup shots of the tag. 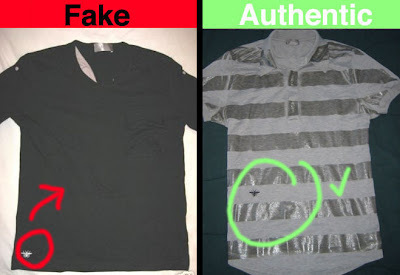 Most sellers on sites like yahoo auctions and eBay know to do this if they are selling authentic items. But, don't be afraid to ask. They are trying to get your business, and they need to work for it. Becoming familiar with the size, font, and proportions of the brand's labels is crucial. Brands rarely change their tags and when they do it is usually major. For detailed information on specific brands please click on the 'Hunting Specifics' drop-down menu to the right. How To Identify Good vs. Bad eBay Sellers. Look at the seller's feedback: Know your seller (or get to know your seller). You should look at what items he/she has sold in the past. You should also look at the actual remarks left, not just the positive or negative feedback score. There a some sellers out there that are notorious for selling fakes who have 100% positive feedback ratings. This is for several reasons. Firstly, some buyers have no idea what they are buying and have never seen the actual thing in a store. Secondly, some buyers don't mind the fakes and would rather save a couple of bucks (although I am sure they look like crap when they get dressed in the morning because they are more concerned with the logos, albeit fake, than the quality). But, many times buyers are afraid to leave a seller a negative feedback because they fear the seller will retaliate and do the same to them. As a result a buyer may leave positive or neutral feedback for a fake item but say something like "I was not satisfied but seller issued a refund" or, "Not quite what I expected but the price was good." If you see a lot of this type of comment it's a warning sign and means you should investigate further. Perhaps send a message to the buyer asking him/her why they were unsatisfied with the item the seller sold. Location: One warning sign is a seller listed in China/Hong Kong. Now, please note, there are some good sellers from there who do sell authentic stuff, but I have only seen a couple. The rest are all fakes. If you see China or Hong Kong in the location be very cautious, but remember, this is just a warning sign. There are also many sellers listed in other countries (such as Germany, UK, USA, Canada, etc) that also sell fakes. The reason so many China /Hong Kong sellers are dealing fakes is because many of the fakes are often made there and/or sold from there. The government has been pretty lax in such matters. That, in combination with the cheap labor makes it ideal for counterfeiters. Communication: If you are not positive an item is authentic feel free to ask the seller any questions you may have. If the seller is responsive and provides you with the information you request it is a good sign. A legit seller should be willing to work with you to answer your questions and not yell at you for asking them. The Seller's Other Listings: Check what else the seller has listed. 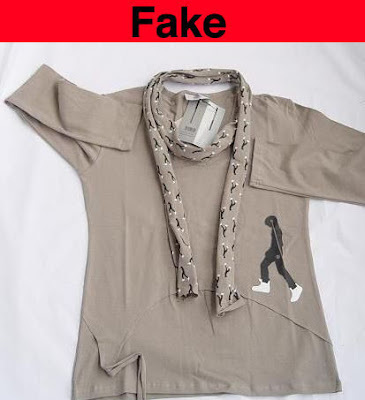 Many sellers of fake designer clothing list many of the same item at once, including many in different sizes. If you see a seller selling 30 John Galliano tee shirts, it is cause for MAJOR suspicion. Also, even if you can't tell if the item you are interested in is fake you may be able to tell if the other things the seller has listed are (which would suggest all of them are fake). Also, be aware that in some cases an eBay member may buy a fake online, not knowing it is fake, then, re-list it either because they changed their mind about it, or they realized it was fake when the package arrived. If a seller is selling something they purchased on eBay check their feedback to see who they bought it from. I sell authentic designer clothing on eBay (mostly men's). I've been getting a lot of emails from other eBayers asking me if I could give them tips on authenticating a particular item, or, if I could look at an item on eBay and tell them if it's authentic. I've decided there needs to be some sort of an 'authentication database' where people can research a particular item. Not that I mind answering their questions, but, I figure that for every person who actually asks me about some item on eBay there are (100s?) more who don't ask, but who do need the information. Although there are policies and safeguards in place to prevent the sale of fakes on eBay, these measures do little to prevent the highly lucrative business of counterfeit luxury goods. The number of fake designer items on eBay (and the rest of the web) is on the rise. The most effective way for us to fight it is NOT to buy them. To do this you need to know what to look for. I would hazard a guess that the majority of people who buy the fakes online are not aware that the item is fake until they receive it in the mail. Many fakes look pretty good in the pictures but the actual fabric, craftsmanship, and detailing is VERY poor. It will start falling apart as soon as you open the package. 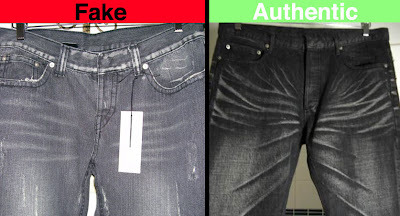 In this blog I will post articles on the basics of authenticating designer clothing over the internet. I'll regularly post helpful information concerning the authentication of specific products (ie. 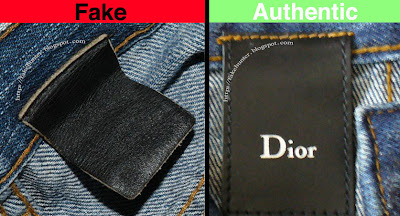 real vs. fake Dolce & Gabbana jeans, or real vs. fake Dior Homme shoes, etc.). I will also periodically post fashion and style updates and links that I think might be of interest to the readers of this blog. I am a guy, so the posts will often focus on men's fashion. However, many of the articles and posts in this blog should also prove helpful to the female readers/buyers. I want this blog to be an open forum so please post your comments, tips, and suggestions. Your input is welcomed and appreciated. .....that wasn't a long-winded post was it? As of this post I have been buying and selling on eBay.com for just short of seven years (since August of 2000). The vast majority of what I buy and sell is men's designer clothing. I love fashion and, thanks to eBay, it has become my primary source of income (eBay ID: couture_homme). The problem with buying and selling designer clothing on eBay is that a lot of the listings out there are for knock-offs. People get scammed out of their money every day buying fakes online, but you can learn how to spot and avoid fake luxury goods. You just have to know what to look for. 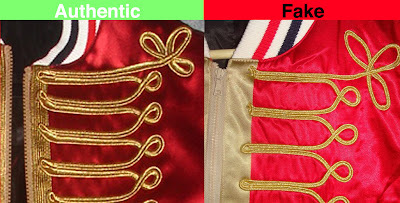 My years of experience on eBay and with authentic designer clothing have made me rather web-wise to the knock-offs. I have had a lot of authentic designer clothing pass though my hands so I know how it looks, feels, and fits. I never thought I would start a blog, but over the years I have noticed the growing need for this information. I don't like seeing people getting ripped off just because they can't afford something at full price in a store. I don't like loosing business to people selling fakes, and I don't like hearing about people who are scared to shop online because of the knock-offs. I'm creating this blog to share what I know about sorting out the fakes from the authentic bargains. I hope you find it helpful.